In explaining the International Vision, I have often alluded to the fact that this vision did not come to me in a dream, or in a supernatural visitation. It came as a result of an officer asking what I saw if mission priorities were actioned. I answered that I saw what I have always seen, an army on the move. Capturing that imagery is of course not rocket science. Not one of us thinks of any army as fulfilling its mission by staying in the barracks or marching in precision on the parade square. Whether it is a peacekeeping assignment or fighting force or emergency deployment, strategy and action are identifiable marks. Since writing to you last December, I have seen our Army on the move in the territories of India Western, India Central, Japan and Sri Lanka as well as our new work in Nepal. In the farewell of Commissioners Barry and Sue Swanson (Chief of the Staff and World President of Women’s Ministries) and the welcoming of their successors, Commissioners André and Silvia Cox, along with the moves of so many leaders around the world, the Army was literally also on the move. Hopefully you have caught up with all of these visits and special occasions through our International News Releases (www.salvationarmy.org/ihq/news). Do you ever wonder what the Lord sees when he watches us? He surely has his eyes wide open to the great things that are happening through the dedicated, compassionate action of Salvationists. He sees the crowds of people in India as they meet together for worship, and their spontaneous and reverent kneeling at the mercy seat. He sees the faithful Salvationists in Japan, who meet the needs of suffering humanity in their numerous social centres. I even think he smiles when he sees three elephants in an Army march in Sri Lanka, bearing on their foreheads the One Army, One Mission, One Message logo. But even more significantly, he smiles when he sees this vision actioned in Salvationist’s wonderful work among orphaned children and youth. He was watching the officer couple and their two daughters on the streets of Kathmandu, Nepal, as they courageously carried the Army flag and their tambourines to celebrate an Easter sunrise service. And when we meet to honour leaders who are prepared to move around the world and take on challenging assignments for his sake, he is there, watching, listening. The Lord not only sees what is happening but he also sees the path ahead, the way we should take as his Army. A very special Scripture verse for many of us is ‘I will instruct you. I will teach you the way that you should go. I will advise you as my eyes watch over you’ (Psalm 32:8 GOD’S WORD ® Translation). Yes, we can strategise, envision and even move forward, but in truth, not one of us knows the future, knows what lies ahead. All the imagining in the world cannot guarantee effectiveness in mission or fruitfulness in service. But the One who sees, knows. It may sound like a slick slogan or even a paradox, but an Army on the march must be an Army on its knees. The vision can only be actualised as we have his guidance and commit to it. It is true for The Salvation Army but it is also true for you, for me. Personal plans or dreams or the best of intentions still belong to an uncertain future. Though it is uncertain to us, it is not to him. The One who sees your life, my life, today is the One who delights to give us a future and a hope (Jeremiah 29:11). "Homophobia in the Salvation Army?" The broadcast last week of, "People and Faith" on Swedish Radio featured a program entitled 'Homophobia in the Salvation Army' that highlighted the Swedish State Government financial subsidy to EKHO's efforts to change the Salvation Army’s Bible interpretation-position relative to homosexuals (being accepted as full fledged church members). - Stefan Gustavsson, director of the Swedish Evangelical Alliance, who questions why the government pays money to an organization in order to change the biblical vision of a Christian community. 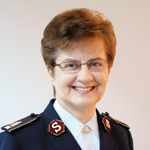 - (Commissioner) Marie Willermark, leader of The Salvation Army in Sweden / Latvia, who clarifies the Salvation Army's position on the issue. - Patrick Olterman, Corps Commanding Officer Malmö, who think it is tragic that the debate is about EKHO's grant application and not on how (church) congregations receive homosexuals. - Cay Lennart Larsson, ‘Rainbow Priest’ (Lutheran Church), bisexual and former member of the Salvation Army, who says he loves the Salvation Army but not their ethical position condemning homosexual relationships. ‘But hey, Cay Lennart, I understand that you think that the Salvation Army should have another Biblical viewpoint, but how can you say that the Salvation Army’s ethical position condemns homosexuals? The closest reference I can find that touches the question is this statement’: "We believe that God's view of sexuality is that it is expressed (lived) lovingly and mutually between a man and woman in marriage, and further, that it should be characterized by mutual consent and free will." How can you call this ‘condemning homosexuals’? It is as faulty as saying that, "the Salvation Army condemns heterosexuals who are not married." But the Salvation Army condemns neither heterosexual or homosexual or bisexual persons for that matter. But there is no human right (stipulating that one has a claim) to be a Salvationist. All associations, churches and organizations have some form of restrictions on who may (qualify to) be a member or not. What is the reason that people living in a homosexual relationship may not be accepted as Salvationists (SA soldiers) or officers in the Salvation Army? Let me say that I am no official spokesman on behalf of the Salvation Army; I simply have the right to my opinion. 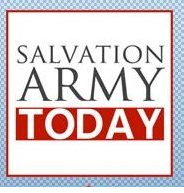 The reason that those who are living in sexual relationships outside of marriage between a man and a woman cannot be a Salvation Army soldier or SA officer is that the Salvation Army still believes in the authority of the Bible. It is expressed clearly in the Salvation Army's first doctrine: "We believe that the Old and New Testament Scriptures were given by inspiration of God, and that they only (alone) constitute the Divine rule of Christian faith and practice." If one does not believe in the Bible, of course, then one need not worry about what is written there. However, if one believes in God and the Bible there must be consequences in how one live their life. · One must be willing to live by the Salvation Army's ethical values. This applies to heterosexuals, homosexuals and all others. This week has contained a number of flashbacks from our time in Latvia. On Monday Edgars arrived in Riga with our last belongings from Latvia. Some boxes with books and a small sofa. He returned to Latvia with the boat on Tuesday with the mini-bus filled sith humanitarian aid things from Stockholm. We had good talks with Edgars and we were updated about the present situation for our friends in Latvia. Friday night we met our successor as leader for the Salvation Army work in Latvia, Christine Bailey from United Kingdom, and "our" personal secretary and translator Iveta Rasa. Iveta is no longer "our", that is why I had to write "our" between these signs "". Saturday it was the annual meeting for "the Skangali Friends", a support group for the work at Skangal, which was donated by the Palme family after the liberation from the Sovjet Union. Christine presented herself in the meeting and gave her first impressions from Latvia. She summarized her impressions with the words Admiration, Focused work and Warmth. Modris, the director for Skangal reported what has happened at Skangal since last meeting and Marie Willermark ended the gathering with a devotion. Bertil Rodin, Mr. Skangal, was leading the meeting. New soldiers. The Salvation army is growing (1). Pictures from some of the soldiers enrolments during 2012. The pictures are from Bauska, Iecava, Sarkani and Liepa..
New corps. The Salvation Army is growing (2). Two new corps opened in March 2012. Corps number 8 and number 9. Both Seda and Drusti have had several soldiers enrolments and they were now ready to be Corps of their own. The Congress in Riga in June was a highligt during 2012. You can see the march to the opening meeting, the tambourine brigade at an open air meeting and Riga Staff Songster. Children´s musical. During the Congress children from all over Latvia performed the musical "What´s up Zak?" New Officers. The Salvation Army is growing (3). Eight new Officers were ordained during the Congress. Summer camps. Pictures from the Children´s camp in Ainaze and from the Family Camp at Beranti on the West Coast of Latvia. New Corps plantings. The Salvation Army is growing (4). In the end of the summer two new Corps Plantings were opened. One in Agenskalns in Riga and one in Saldus. The Social Center in Riga. Pictures from the preparation of food parcels and from the sowing studia at the center. Congress in Prague. More than 80 participants from Latvia took part in the European Congress in Prague during October 2012. EU-project. During 2012 a life skill program financed by EU has taken place at Riga first Corps. Emergency team. In 2012 a new emergence team has been organized. Here you can see the Salvation Army officer in charge surraound by the fire fighters at Riga Fire Department. Borås News Paper. At Christmas time a Swedish Daily Paper made a nine page long report from the Salvation Army work in Latvia. There are of course much more to be told about the work in Latvia during 2012, but this report gives some hints. Now it is Sunday morning and time to go to Stockholm for the Sunday service. And then...another week. I pray it will be a blessed week for you.